WiFi is great when it works but incredibly annoying when it doesn’t. There are several reasons your internet connection might not be working properly, but a lot of the time it just comes down to signal interference. 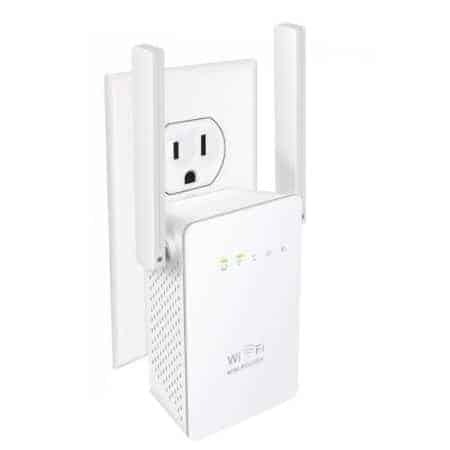 Whether you’re fortunate enough to have a really large home or unfortunate enough to have thick, old walls, there’s a good chance you could benefit from a WiFi extender. We’ve rounded up some of the best WiFi extenders today so you don’t have to. Before we list our favorite WiFi extenders, there are a few things you should know about them. Some will be better suited to your needs than others, so it’s important you take a few seconds to read up on their specifications. Luckily, we’ve created a short guide which you can read below. There are two commonly used WiFi bands, 2.4GHz, and 5GHz. Some extenders support both of these, while others (usually the less expensive models) support only 2.4GHz. Essentially, a router with a 2.4 GHz frequency will provide a larger area of coverage but slower internet speeds. In contrast, one with a frequency of 5GHz offers a smaller coverage radius but faster browsing. Of course, if your router doesn’t support 5GHz WiFi, a 5GHz extender isn’t going to work. For this reason, it’s important to make sure your hardware is up to scratch before spending any money. If your router supports both frequencies, you get the best of both worlds and might want to consider spending a little more on an extender. You probably haven’t considered this, but WiFi is really just the transmission of radio waves from a sender (your router) to a receiver (your WiFi antenna, computer, and so on). Anything that can block or disrupt these waves can cause slow speeds, or even an inability to connect. It’s worth thinking about why you need an extender in the first place. For instance, if thick walls are your main issue, is it possible to move your router somewhere that would provide better coverage? If the distance is the problem, there aren’t really any ways to improve this other than by buying an extender or an additional router. Given that routers are usually far more expensive, an extender would be an excellent choice in this situation. We know that purchasing a WiFi extender is often a matter of necessity rather than intent. For this reason, it stands that most people will want a fairly inexpensive product. Not to worry! Below, we’ve listed three excellent extenders that cost less than $30. 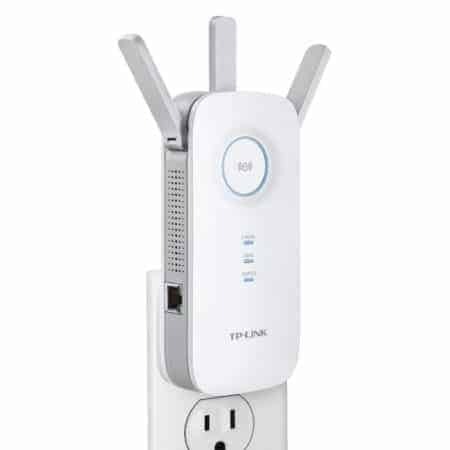 Our first recommendation is the TP-Link AC750. 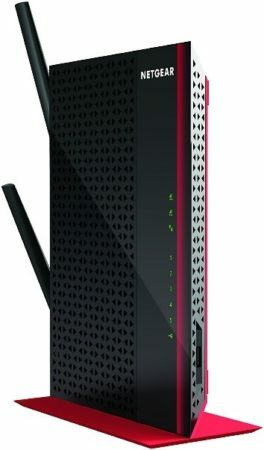 This is a dual-band WiFi extender that offers a dedicated high-speed mode for gaming and HD streaming. It even has an indicator LED that shows you the strength of the signal that it’s receiving. This lets you find the ideal position in your home and takes the guesswork out of setting it up. 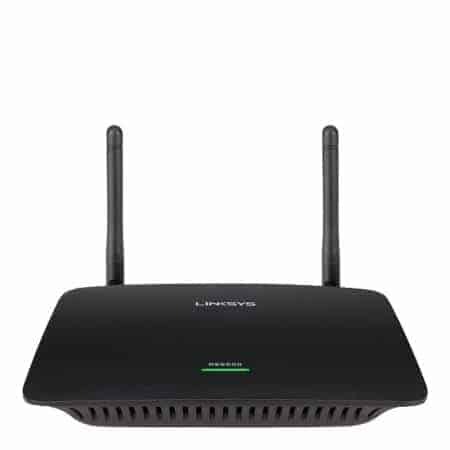 Not only that, but the AC750 is backward compatible and supports all 802.11 b/g/n/ac devices so even if your hardware is on the older side, you should have no problems connecting. This makes it an excellent choice for people who aren’t very technically minded and who want their extender to “just work”. Next up we have the MECO Extender. 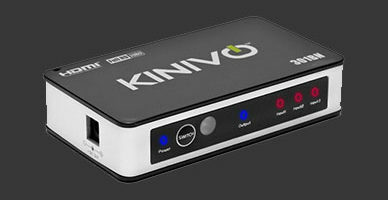 This is marketed as being a mini-extender – one that’s far smaller than its rivals yet delivers comparable service. While it only works with 2.4GHz frequency bands, it costs around $20 so it’s difficult to complain. 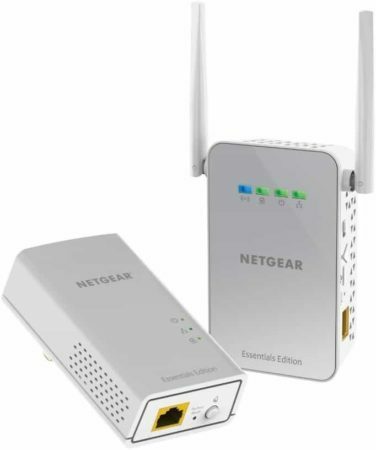 This extender can also be used as a network bridge thanks to its two network interfaces and features a WPS button for fast, no hassle connection. This can be a lifesaver, especially if you’ve forgotten the passcode you used to set the router up. This product supports all popular passkey encryption standards, although its default password is publically available, so we’d advise changing this as soon as you can. All in all, not a bad product at all. Lastly, we have the Netgear N300. As a 2.4GHz extender, this model provides network speeds of up to 300Mbps. This is around 37.5MB/s, which is more than fast enough to stream video in 4K. 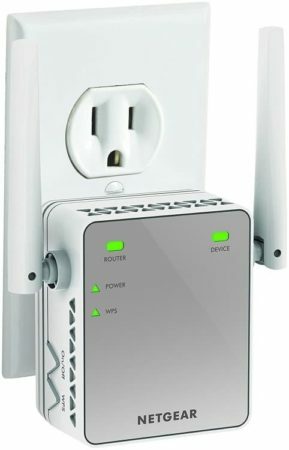 It uses its two external antennas to connect to any standard router or gateway and even includes an Ethernet port for faster internet on wired devices. This prevents you from having really long cables through your house. Well, there’s more. Netgear even has an app that allows you to monitor the extender’s signal strength and identify the specific channels that have the least amount of traffic. This allows you to customize your connection, as long as you have the time and drive to poke around in the settings. Sometimes you just want a WiFi repeater that can send your signal as far as possible. If this sounds like you, you might be interested in the models below. These prioritize distance over all else and are sure to suit your needs perfectly. First of all, let’s take a look at the TP-LINK AC1750. This a dual-band extender that uses its three fold-down antennas to ensure it receives the best signal possible. Good right? Well, it gets better. These amplified antennas mean that you can cover around 10,000 square feet. In simple terms, it’s enough to reach a computer about 30 meters away from the extender. There’s also an Ethernet port for people who don’t mind cables lying around. 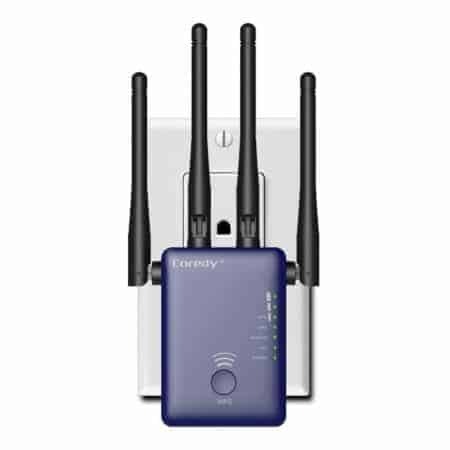 This model is compatible with any router or access point and better still, it can be combined with TP-Link app to get detailed information about the quality of your connection. This makes it perfect for people who like to get more involved with their tech, but it’ll also work for people looking for a “plug and play” solution. Next, we have the Coredy AC1200. This model costs around $50 and comes with four movable antennas. There are a further two Ethernet ports that allow you to connect to wired LANs and create a new wireless network. That’s not all this product has to offer: it can be set up manually, through your internet browser, or with the one-touch WPS button. It’s compatible with every router too, making it an excellent choice people who want all the advantages with none of the fuss. It’s worth mentioning that this model supports both frequency bands, so if you find that you don’t need some of the extra range, you can connect to the 5GHz network and increase your speeds. It’s the best of both worlds. Lastly, we have the NETGEAR AC1200. This is a visually striking repeater that uses its own dual-core processor to enhance your WiFi performance further than most of its rivals. It’s a dual-band product that comes with four Ethernet ports. This means it’s more focused towards people with complex computing setups, but it can feasibly be used by anyone, even if you aren’t technically minded. At around $90, this repeater won’t be for everyone. However, those with a little extra room in the budget will find this model’s versatility and customization options very useful indeed. There are hundreds of low priced WiFi extenders, and they generally work well enough. If you’re looking for additional functionality and a better overall experience, however, you might want to consider spending a little more. 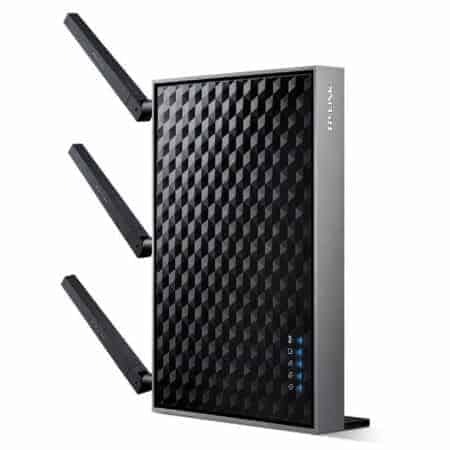 For instance, check out the NETGEAR Nighthawk X4 AC2200. It provides a maximum internet speed of 2200Mbps, or around 275MB/s. For context, that’s fast enough to stream 4K video on ten devices at once. Wow. Things are equally impressive on the inside. This model uses amplifiers and signal boosting software to reduce network downtime and offer a fast, consistent connection. 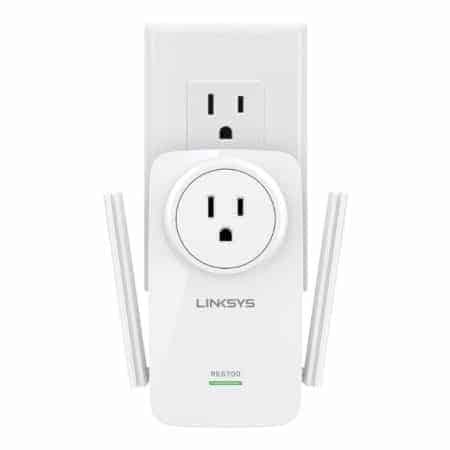 Not only that, but it’s compatible with any router and can be used to either connect to an existing network or create a new one. In short, for under $150, you can have a WiFi extender that does it all. Another great contender is the Linksys AC1200. This is a nice, compact repeater that doesn’t require any router configuration or difficult setup process. That’s not all we liked, though. This product uses both frequency bands to create a new one that features all of the advantages with none of the downsides. This means that your connection will be faster and more stable than with a standard dual-band extender. There’s even a dedicated feature for streaming music. This allows you to connect an external speaker for enhanced audio quality. Of course, this is a small addition but one that the music lovers among us will surely appreciate. Last, let’s look at the Actiontec WCB3000N01. It doesn’t have the catchiest name but it does have dual-band antennas, Ethernet ports, and even a coaxial input. Actiontec has an app that lets you monitor and manage your network at all times. You can connect to almost any device and with the WPS connection, the process takes less than a minute. We also really liked that this product comes with 24/7 customer support. When you’re spending around $60 on a piece of tech, it’s nice to know that you’ll always have access to the help you need. In short, this model is one of the best around in its price range and would be a great fit for most homes or offices. Sometimes you’re going to want to extend WiFi across a large distance, but it’s not safe to use most WiFi repeaters outdoors. The products below have no problem with a little rain, though, and can help you out. 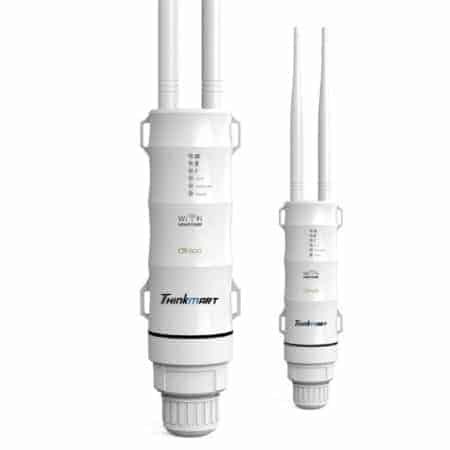 The Thinkmart repeater is a dual-band model that boasts a maximum transmission range of 1.5km. This decreases if there are any obstructions, but it’s still a massive increase over your standard repeaters. This product is very versatile. It can be used as a standalone router, an amplified repeater, or even a new access point. It’s weatherproof too and can be mounted to high walls to get a clearer signal. You have free reign over this model’s positioning, so go wild. That’s not all. The Thinkmart is backward compatible and will work alongside any router, bridge, or access point. This is great because it means you won’t have to upgrade anything just to get your extender to work. Next, we have the Ubiquiti NanoStation locoM2. This one is a little different from the others we’ve seen: it’s a 2.4GHz directional transmitter/receiver. Essentially, this product receives a signal which it then transmits in a straight line for up to three miles. This is fantastic if you have a large estate to cover, or if you’d like to send WiFi signals to another building, say an office. As before, this model relies heavily on line of sight, so if there are a lot of buildings or trees in the way, your maximum range will be reduced. This is a niche product, sure, but it has many useful applications and can save you from buying multiple routers or miles of cable. 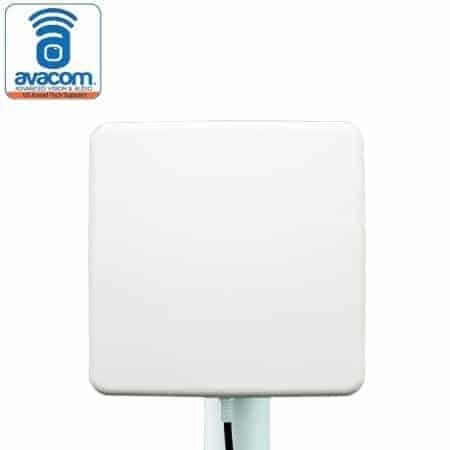 The AVACOM extender has a larger panel that most of the others. This allows it to receive a stronger, clearer WiFi signal, which is great because if you’re going to be sending it huge distances you’ll need all the help you can get. Now, it’s important to note that this repeater is 2.4GHz only. This might seem like a disadvantage but it’s part of the reason you can get such long ranges. Not everybody is going to need something like this, but the one who do will find the AVACOM to be a useful and inexpensive addition to their networking arsenal. Networks, like the people who create them, can range from simple to incredibly complex. Our final category is dedicated to the products that can best adapt to these difficult networks and provide additional functionality to make everyone’s lives easier. Let’s begin with the Linksys AC1200 MAX. This costs around $70 at the time of this writing and is a dual-band extender that works with any standard router or gateway. This repeater automatically manages your traffic across the two frequency bands to minimize waiting time and maximize overall data transfer. This makes it excellent for offices or other settings with many simultaneous users. It has a one-touch WPS button setup, and an indicator light that lets you know the best location to place it. This takes the guesswork out of your setup and means that you can get to using the internet as soon as possible. We’ve reached our second-last recommendation, the NETGEAR PowerLINE. This product uses your home’s electrical wiring to extend your network – neat, right? 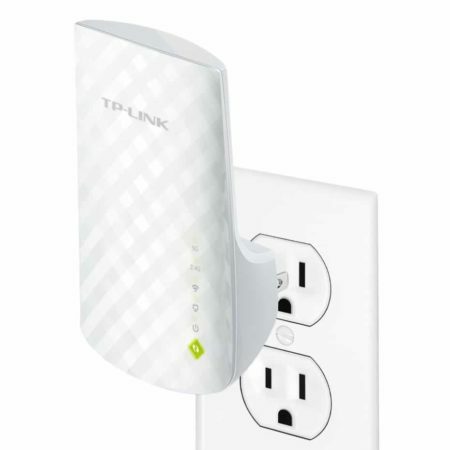 Setup is simple: just plug one unit into your router and the second into an electrical outlet elsewhere in your home. This approach means that thick walls are no longer an issue, allowing you to experience speeds of up to 1000Mbps wherever you like. It even has something for wired connections – its single gigabit Ethernet port means that fast speeds aren’t limited to devices with WiFi compatibility. Simply put, the NETGEAR PowerLINE is a solid all-around extender with very few flaws. We’ve finally reached the last product, the TP-Link AC1900. This product is a beast – it has five Gigabit Ethernet ports, three antennas, and can use both frequency bands. In short, there’s very little that it can’t do. You might be expecting a high price tag, but the TP-Link AC1900 costs around $90, which is fairly standard. Good news: that’s not the best thing about it. The AC1900 makes it very simple to experience high-speed internet anywhere in your home. It has a WPS button and signal strength light to help with placement, plus the dual-core processor takes care of all the traffic automatically so you don’t have to configure it at all.